Carrie, from Ginger Lemon Girl, is hosting this week’s Gluten-Free Holiday and the theme is breakfast and brunch. She sent out a call to a bunch of gluten-free bloggers in the hopes of getting 100 recipes linked up this week. Let’s help her out, shall we? Traditionally, in my family, holiday breakfasts come from a tube. Yep, that’s right – Pillsbury cinnamon rolls with ooey gooey frosting slathered on. My sister and I would fight for who got the middle roll. It had the most frosting and no crispy edges. (Those brownies pans designed to make lots of crispy edges? Those would never have worked in my family.) And, while I’d love to work some sort of amazing magic and come up with a cinnamon roll recipe that’s grain-free, vegan, and made without refined cane sugar, but still tastes good, so far I’ve failed. What I did come up with, though, was a cinnamon roll scone – sweet, but not too sweet, with a crisp exterior and a soft interior. And, yes, they’re vegan and grain-free and free of refined cane sugar. Woo hoo! Divide the dough in half. Pat out half the dough into a circle on a parchment lined cookie sheet. Sprinkle dough with filling. Between your hands, pat out the second half of dough until it is roughly the same size and shape as the bottom half. Gently press the top half over the filling. If needed, wet your hands and smooth over any breaks in the dough. Using a wet pizza cutter, score the scones into 8 triangle-shaped pieces. Bake for 20 minutes, rotating pan half-way through. Remove from oven. Re-cut triangles, separate them on the baking sheet, and bake for 5 more minutes. Remove from oven and cool completely. If desired, you can drizzle these with a frosting made with powdered palm sugar, cinnamon and almond milk. Not a roll, but sin-sin cinnamony good. For more slightly indulgent recipes, check out Slightly Indulgent Tuesdays. And, for more healthy recipes, visit the Hearth and Soul Blog Hop and Real Food Wednesdays. For more gluten-free recipes, check out Gluten-Free Wednesdays. Don’t forget to sign up for the Gluten-Free Allergen-Free Expo in Chicago. I was recently invited to attend as a gluten-free blogger and I’d love to meet you there. But, prices go up December 25th! Finally – the good people at Katz Bakery are sponsoring another great giveaway. Head on over to their site to enter! This entry was posted in breakfast, grain-free, vegan and tagged almond, brunch, cinnamon, coconut flour, grain-free, vegan. Bookmark the permalink. OH MY GOSH!!! Thank you SOOOOO much!!! I seriously cannot wait to try this! I really don’t use my coconut flour nearly often enough! (I’m always at a loss for what to do with it! lol) And thank you so much for linking up to my round up! I can’t tell you how much I appreciate it!! You’re welcome, Carrie! I’ve really gotten into coconut flour lately. I HATED it at first, until I realized that the brand I was using just did not work and was nothing like the coconut flour that everyone else was using. Now I use the Tropical Traditions coconut flour, and I love it. It takes some used to to figure out how to create recipes with it, but it’s so worth it. Exxxcellent idea. I loved your apple scones so much, I’m sure I’d love these too. I do so remember those tubes of cinnamon rolls. I haven’t gotten on the coconut flour bandwagon yet, so good to know which brand to try. Your Vegan Chili Verde turned out great by the way. Thanks for a satisfying dinner! Bob’s Red Mill coconut flour is good, too. The brand that didn’t work was “Let’s Do Organic.” It’s not really flour – more like finely shredded coconut. And, everything I made with it just collapsed/spread/fell apart. Gee – that’s cause it’s not actually flour, eh? I’m glad you liked the vegan chili verde! Those look amazing! Just looking at the picture and the recipe made my mouth water and my stomach growl. Definately gonna have to try this one! These scones look scrumptious and so simple. Question for you: could I just grind almonds in the food processor and use the resulting meal, or is the TJ almond meal very fine? It’s fairly finely ground and includes the skins. But, grinding your own might work. 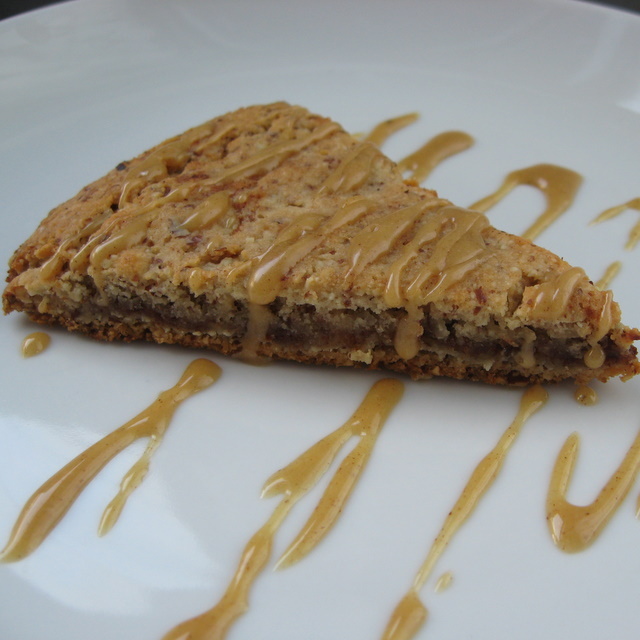 Hazelnut or pecan meal – like from the baking section of the regular grocery would also work. It’s that consistency. These look amazing! You rock! Seriously, you come up with the best recipes, I love it. Thank you Maggie! That means a lot coming from you – you come up with great stuff, too! Thank you Carol – same to you! I am always searching for grain free recipes and this looks wonderful. Thanks for sharing. I’m putting it on my “to try” list. Waw!! These look mighty pretty & so tasty too! These look wonderful!! I haven’t done much gluten-free cooking at all, but it really intrigues me. Mainly because I have a small flour obsession 😛 Once I finalllly get almond meal, I absolutely must try these. Thanks, Jess. I hope you give them a try and like them! well cinnamon rolls are yummy, and scones are yummy, so I KNOW that cinnamon roll scones must be delish!! Wow, these are amazing! I just made them (with a few adjustments) and ate probably half the scones (I didn’t count :o)). I used birch xylitol instead of the palm sugar, since I am staying away from sugars and grains, and baking soda (a little less than the recipe calls for) instead of baking powder, as baking powder usually has corn starch in it (ours did). I also used organic ghee instead of palm shortening and oil, and water instead of almond milk. I hardly needed more than 1/4 cup of water + apple cider vinegar to make the dough. For the frosting, I finely ground birch xylitol in a coffee grinder, then added a tiny bit of water, just enough to make a thick paste to put on the tops of the scones. I ground my own almonds with a little bit of agar agar powder/xanthan gum in a coffee grinder to make almond meal. I also added a little pinch of vanilla bean powder. The scones turned out amazing! By the way, I used the Let’s Do Organic coconut flour, and it worked fine. Thanks so much for the recipe! I was craving cinnamon rolls, and this hit the spot! So glad you were able to adapt the recipe to work for you! I’m guessing that the reason you needed less liquid was because of the Let’s Do Organic coconut flour. It’s much less “thirsty” than other coconut flours. I have Almond Flour on hand. Can I just use that and adjust the amount? I’m thinking I would need less almond flour than meal…yes? If you go by weight, you could probably sub an equal amount of almond flour. 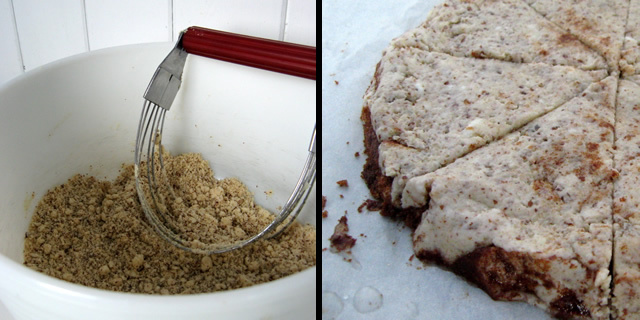 Almond meal gives a more flavor than almond flour. That will be your biggest difference.